MACUCC: Do you have one of THOSE people in your church? MACUCC: Do you have one of THOSE people in your church? Do you have one of THOSE people in your church? You know, the ones who are all over Facebook or other social media sites. Posting vacation pictures, sharing the latest YouTube sensations, always “liking” what everyone else is up to. It won’t be a surprise to anyone that I’m one of those people. I use Facebook a lot – for connecting with friends, for communicating about the ministry of the Massachusetts Conference, and for spreading news from my own church. I also use it to run a small business, and to connect with other parents in Franklin, where I live. Which is why it was still early in the planning stages when I heard about a candlelight vigil being organized to memorialize the two young school children from our community who died after being trapped in a hope chest. Plans for the vigil came together almost entirely on Facebook, and Facebook is how most people were hearing about it. When I saw the vigil event page pop up on Facebook on a Wednesday morning, a couple dozen people had responded that they would be there. By Wednesday night, that number was over 200. By Thursday night, over 400. At this point, the vigil – being held Friday – hadn’t even been mentioned by traditional news outlets. My church, Franklin Federated, sits right across the street from the town common where the vigil was to be held. Hundreds of people, including many children, would be gathered in grief just outside our building. Realizing that, I got in touch with church leaders (our pastor was away), told them about the vigil, and suggested we should open our doors. Plans very quickly evolved to open up that evening to offer warmth, comfort, restrooms, hot chocolate and cookies. We got in touch with the vigil organizers, who were grateful for our invitation, which they posted on the Facebook event page that Wednesday night. Dozens of people “shared" that invitation while I helped spread it through other channels on Facebook. 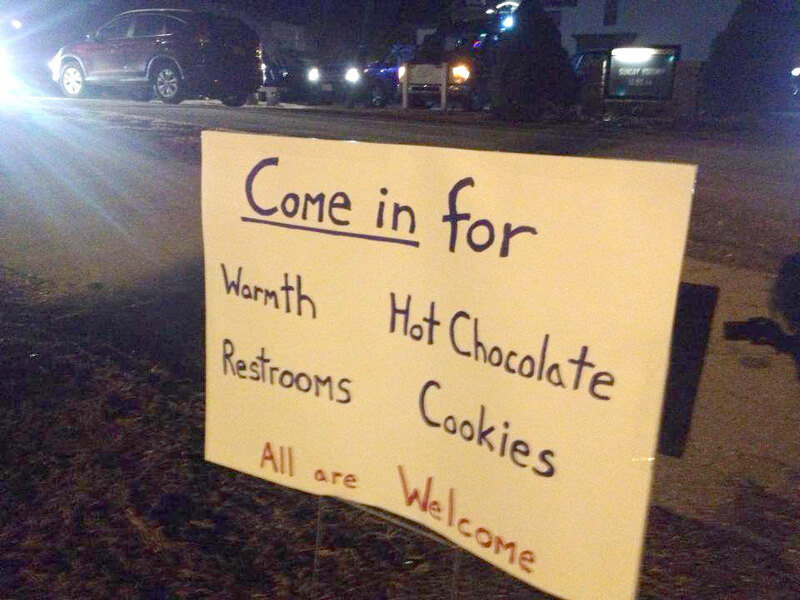 On the evening of the vigil, we put up a simple hand-made sign outside, inviting people in. We didn’t know what to expect. We had faith that church members would come through with cookies, and they did. What we didn’t expect were the people with no connection to the church who dropped off snacks and beverages because they wanted to help. Then, after the vigil, nearly 100 people came through the church doors. Some grabbed a hot chocolate and a cookie and left with a thank you. Others used the restrooms and went on their way. Some sought solitude in the sanctuary. A good number of children and their parents – many of whom had never been in the building before – sat in a circle in the parlor, talking and snacking. In a nutshell, our community needed comfort, and we were there to provide it. But the fact is, had no one in the church been “plugged in” to the wider community via social media, that would not have happened. We would not have found out about the vigil in time to respond in the way that we did. You’ve probably got one of THOSE plugged in people in your church. Maybe more than one. Now is the time to make sure that person knows what an important connection he or she is between the church and the wider community. Ask her to help loop the church into that web of connections that is happening online. Ask him to always keep one eye out for where the church might fit into the conversations and actions going on around him. Don’t miss this opportunity.